April is always a scary month in the wine business. No, not because of tax season . . .but that certainly is scary in and of itself! It’s a time when the vines have reawakened and start to grow, and bud break is in full swing. Inside each of these tiny buds, which start out as fuzzy ‘bumps’, are the entire making for the upcoming harvest – primordial leaves, clusters, etc. They are alive yet quite fragile, and any inclement weather can wreak havoc to them at this critical stage. 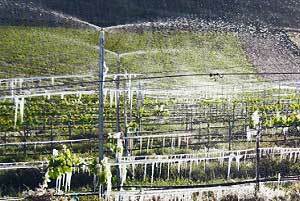 Back in 2008, the Santa Ynez Valley, along with grape growing regions throughout California, were hit with severe frosts that caused major damage to that year’s crops, as well as reducing the next year’s crops, too. Primary buds, so called for they are the first and most fruitful of the buds contained in the plant, were literally frozen off many vines, forcing the plants to push forth secondary buds. These buds, though fruitful, are not as much so as primary ones, and develop more slowly, leading to reduced crops that ripen later in the season, if at all. Many vineyards in our area were devestated, with crop levels anywhere from 10 to 75% below expectations. Last weekend, a cold front brought with it severe frosts once again. It’s too early to tell what the real damage will be, but from what I’ve heard, certain vineyards were very hard hit, with entire blocks having primary buds burned off by the abnormally cold temperatures (hovering at about 25 degrees for 4-6 hours). The damage was fairly widespread, affecting vineyards up and down the state. I’m hopeful that the damage will turn out to be not as bas as projected. I’m hopeful for the growers who provide me and others with such wonderful crops year in and year out and allow us to do what we do. I wish there was more I could do to help, but at this time, all I can do is send positive vibes and hope for warmer times ahead – and fruitful secondary and tertiary buds!